I was first introduced to the work of author-illustrator Miroslav Sasek while visiting my friend Holly, and it was truly love at first sight. 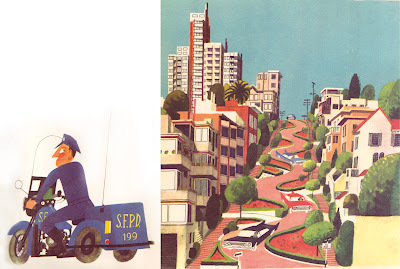 He's produced and incredibly beautiful series of books called This Is, books about cities and countries around the globe intended for children, but were reveered by child and adult alike. In this series Sasek marries stunning cityscapes with his unique eye for architectural composition with the hum-drum of daily life and inner workings of a city. Lucky cities featured include New York, San Franisco, London, Paris, Venice and many more - 18 books in total. They capture the magic and charm of each city and at the same time are a wonderful historical refernce of life around the world in the 1960's. And it does this in a very literal way, feeding you facts and statistic of each location; This is New York: 'One of the tallest buildings in the world - the Empire State Building'. 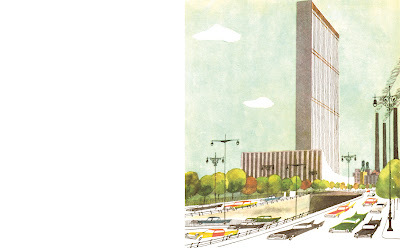 The series are steadily being re-printed and I love the fact that the publishers have not altered these facts and stats in the book, but have added an appendix with fresh information; 'In 1960 the tallest building in the world was the Empire State Building. Today it is the Twin Petronas Towers in Malaysia'. Fantastic! So who was Miroslav Sasek? Sadly, very little is known of Sasek. He was born in Prague, Czechoslovakia in 1916. He trained as an architect (which goes a long way to explain the dominating presence of buildings and cityscapes in his books), but he also studies at the l'Ecole des Beaux Arts in Paris. You can find his books online and in all good bookshops for approx USD$17.95 / €13.20.